We woke up this Monday morning to rain and thunder. It was one of those mornings when I could have slept in if I didn't have 7 kids and a farm to look after. Instead we all met in the kitchen to enjoy fresh donuts (thank you Krispy Kreme) and hot coffee. Today we started back a full load of school. It was a day of math, geography, language, reading, handwriting, science, dog injuries, and torrential rain while milking cows. OK, those last two are exclusive to life with farm animals. Duke was laying in garage with a considerable puncture wound to his side and scrotum. 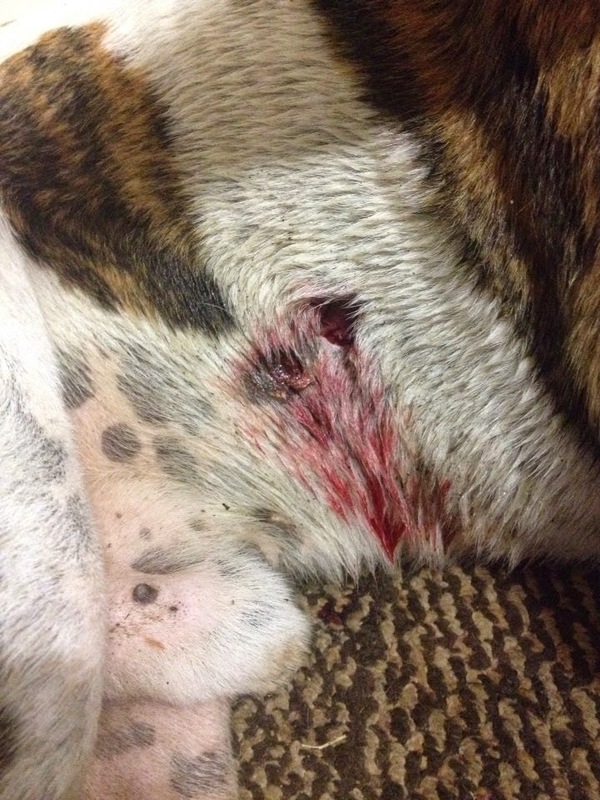 It seems he had a scuffle with some sort of critter and stitches would be needed. Journee kindly drove him to the vet before she had to at her classes. I waited and waited for the rain to let up before we ventured out to milk the cows, but it just never turned to a light rain. We all came in soaking wet and needing a hot shower before the day's lessons could begin. The day went rather smoothly, at least as smoothly as it can be with a 3 year old running around. I am happy to be starting back to a routine, and now I wait for the vet to call and tell me I can go pick my bulldog up. Of course the rain was over by noon and by 1pm the sun was out, hot as ever. I think the humidity is the worst it has been all summer. In the meantime, the cows are really needing a new area to graze. I must keep them off the front pasture until we get the hay cut, and their current fenced paddock is eaten down. It needs a rest. *cue music* Today I sing the praises of electric fencing. I ran an electric fence wire all the way across the front yard, preventing the cows from reaching the front pasture. They have my entire back yard and woods for grazing now. Not only does this give them new grass and more room to roam, but it also cuts down on the mowing we must do, which also saves us in gas. I also let Ivy out to free range with the big girls. Her areas of rain rot are doing much better. Dead skin has fallen off and new skin and hair are growing. Good food will help her get back to health. Of course I had to make sure some hens were out to follow the cows around. There is nothing better than hens to scratch up cow patties by pecking and scratching for fly larva and undigested grain. True Joel Salatin style farming. I agree that it is so nice to settle in to new fall rhythms! Looks like a nice start to your "school" year!